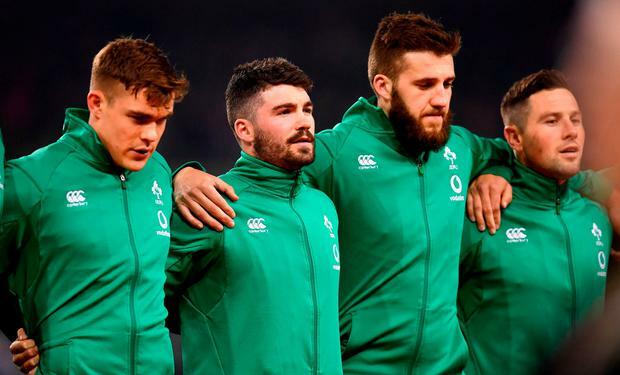 "Rugby supporters at the Aviva Stadium last Saturday night were somewhat taken aback when faced with some prominent DUP members holding a petition urging the Ulster players on the Irish team to switch allegiance to England (or failing that to Wales or even Scotland). "They explained it was in the mission statement of their party to foster and cultivate ever closer ties with the other UK countries especially now that Brexit was becoming a reality, and that sport should be no exception. Their petition, they explained excitedly, had got the enthusiastic approval of Boris Johnson and Jacob Rees-Mogg. However, it was slow in gaining momentum outside the Aviva on Saturday night." Unlike the famous 'War of the Worlds' broadcast by Orson Welles which caused mayhem and consternation (it was so believable), I doubt if any readers were fooled by my work of fiction above. However, in the aftermath of Ireland playing like superheroes and beating the All Blacks, and Brexit on a permanent loop, a number of things occurred to me. Like, isn't it fantastic to see an All-Ireland team in action (in any sport), the green, the orange, indeed all the colours of the rainbow. What an example these sportspeople are setting for other spheres of life with nobody knowing or caring their religion or politics. I wondered what must the extreme Unionists (who never seem to have a good thing to say about us in the Republic) think of their fellow Ulstermen playing for an All-Ireland team, or indeed would they much prefer to see them playing for one of the UK countries? Would shouting on an All-Ireland team cause them a similar struggle to some Sinn Féiners wearing a red flower? Or do they shout and applaud with more gusto than I do myself? I don't know. "The sons and daughters of Unionists and Republicans shall sup at the same table, shall play hurling, rugby and camogie and afterwards gather together in the local hostelry to replay the match." No, I didn't actually have this dream, and at the moment it seems light years away, but Stockdale and Co are certainly showing that when politics and religion are kept in their place, great things can happen. So maybe the rhetoric, the antagonism towards us in the south (and the petition) should be parked; a strong Europe, including Britain in some shape or form is in everyone's interests and maybe we should all become die-hard Unionists...European Unionists. Last Sunday I participated in the "sombre farewell" to the Haunting Soldier in St Stephen's Green in Dublin, as reported in Monday's Irish Independent, as my grand uncle Eddie Costello of Gortaganny in north Roscommon died in the Battle of the Somme on October 12, 1916. He never came home. It was a beautiful ceremony attended by members of the Defence Forces and descendants of fallen soldiers. Around 2,000 members of the public attended. In fact many people showed up on the day eager to acknowledge their connection to soldiers who had participated in the war. In the North of Ireland, elected members of Sinn Féin refuse to take their seats in Westminster. This is an anachronism which has no place in a modern democracy. Previously Sinn Féin refused to take its seats in the Dáil and European Parliament, which it now partakes fully in. It is time to reverse its abstentionist policy in the House of Commons. Its voice could prove pivotal on December 11 when the British parliament votes on the Brexit withdrawal agreement, something that will have profound repercussions for all parts of this island, and its passing is vital if we are to avoid the return of a hard Border. If we can respectfully acknowledge Ireland's participation with the "auld enemy" in World War I in the Republic, then surely, to use a quote from Mary Lou McDonald, it's time for Sinn Féin to "smell the coffee" and provide proper representation for all its constituents where and when it matters across the Irish Sea. Where will Mary Lou end up in flip-flopping times? It would be great fun if Mary Lou McDonald dragged her potential Westminster fellow conflicted folk over there to that London for a sharing of allegiance. Her entourage could be introduced to the House of Commons as "the honourable representatives from places in Ireland anxious to come back to us". The flip-flopping of Sinn Féin means anything could happen, and sure, wouldn't it be lovely. That the inevitable split might occur only means that one is long overdue. Ms O'Neill eventual Speaker of the House? The rising tensions between Russia and Ukraine remind me of the Cold War epoch and Ronald Reagan's speech depicting the former Soviet Union as the 'evil empire' and the struggle between the two superpowers as a struggle between good and evil. The humbling of Western power and authority, the indecision and uncertainty over humanitarian interventions in Libya and Syria, domestic political disillusionment over Brexit, austerity and the international financial crisis and growing concerns over climate change, global warming and environmental degradation necessitate a different approach to espouse differences, allay fears and anxieties and work towards a more peaceable future for all.